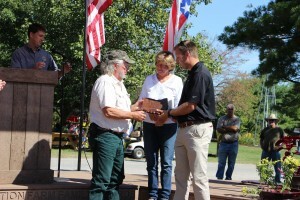 Five farm families were recognized for their conservation efforts at the Farm Science Review, Sept. 22. LONDON, Ohio — Not all conservation efforts go unnoticed. 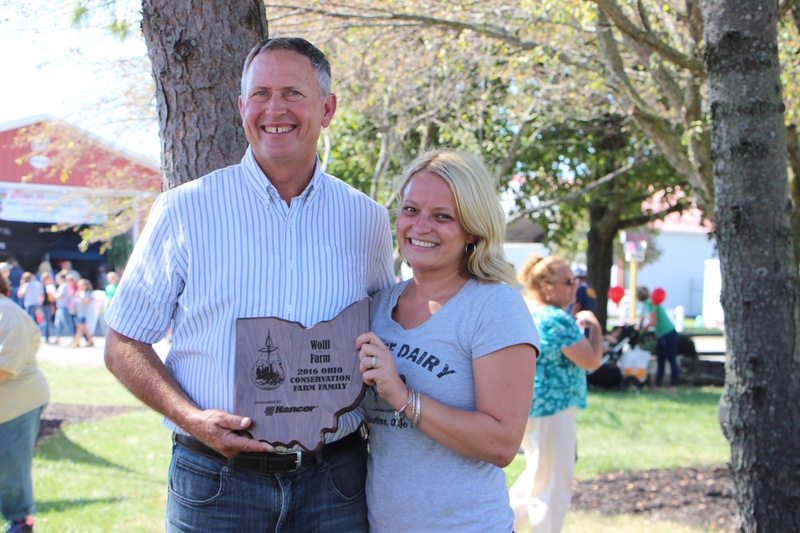 That was the message Kirk Hines, Ohio Department of Agriculture Soil and Water Conservation Division, wanted to share with five Ohio farm families that were recognized for their efforts to go above and beyond to implement conservation practices on their family farms. From a small buffer strip full of cover crop and native plants that attract butterflies and other pollinators, to recycling resources on the farm, each of the families recognized, shared their goal of preserving the farm for generations to come. 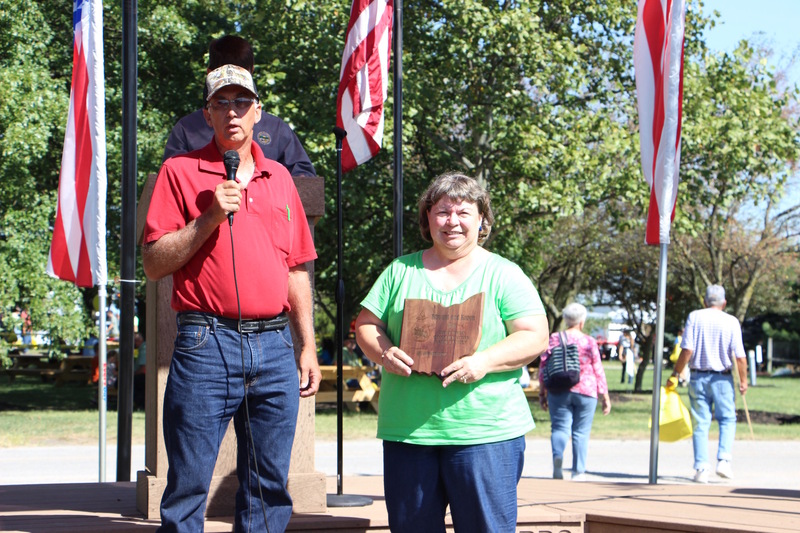 The Ohio Department of Agriculture Soil and Water Conservation Division presented the 33rd annual Conservation Farm Family Awards to five Ohio Farm families at Farm Science Review in London, Ohio, Sept. 22. Ohio farmers face more challenges with farming practices today than their grandparents before them, said Hines. 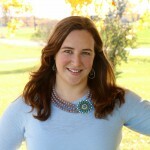 From changes in farming practices, technologies and consumer preferences, Hines said the five farmers recognized today have dealt with these challenges and overcome them in unique ways. The five families honored were: Robert Lill of Marion County; Justin and Lowell Wolff of Medina County; Edward and Karen Bay of Guernsey County; William and Shauna Wilkins of Miami County; and Tim and Sandy Shoemaker and Howard Grabill of Highland County. Robert Lill of Lill Family Farms, in Marion County, accepts a Conservation Farm Family Award at the Farm Science Review, Sept. 22. Robert Lill, of Lill Family Farms, farms more than 1,400 acres of corn, soybeans and wheat in Marion County. Lill’s recent conservation efforts include converting naturally wet ground into a 4.4-acre wetland surrounded by 1.8 acres of mature prairie that is enrolled in the Wetland Reserve Program. Lill’s other conservation practices include using no-till, crop residue management, crop rotation and grass waterways to protect water quality and soil erosion. 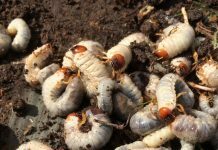 The Lills expressed the importance of having pollinators such as monarchs on the farm, even if it does mean the introduction of milkweed — at least along the edges of the fields. Buffer strips have been implemented to attract wildlife. Lowell Wolff and his son, Justin, of Wolff Farm in Medina County, farm 250 acres of corn, soybeans and wheat and milk Holsteins. The Wolffs installed a milkhouse wastewater system that diverts wash water into a settling tank and sprinkler system, which is then used to irrigate pastureland. Other conservation practices include rotating crops, including cover crops, and using a no-till system for soybeans. Lowell and Justin Wolff, of Wolff Farm in Medina County, received a Conservation Farm Family Award for the northeast Ohio area. Justin’s wife Kara accepted the award alongside Lowell during a special presentation at the Farm Science Review, Sept. 22. The Wolff family takes pride in the abundance of natural resources they have and works hard to conserve those resources for future generations. From the southeast district, Edward and Karen Bay, of Guernsey County, raise Jersey and Angus cattle and farm more than 450 acres of corn and alfalfa hay with 200 acres in pasture. Their conservation practices include installing grass waterways, spring developments, livestock watering facilities, using cover crops, no-till, rotational grazing, manure storage and planting trees to prevent erosion. The Bays have demonstrated non-lethal wildlife damage control by using propane cannons to protect row crops, and offered alfalfa fields to test repellents to deter deer. “We are caretakers of the land and we should leave it better than we found it for future generations,” said Edward. 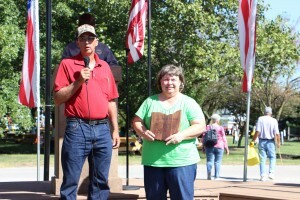 Edward and Karen Bay accepted a Conservation Farm Family Award at Farm Science Review, Sept. 22. Edward also stated it is important to have a good image. “Everyone is watching everything we do. Let’s all make sure we are perceived in a good light,” he said. 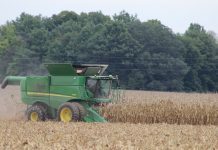 William and Shauna Wilkins have more than 130 acres of corn, soybeans, cereal rye, wheat and hay. They farm around 110 tillable acres using 100 percent no-till rotation of beans and corn. In addition to no-till, the Wilkins use slow release fertilizer, regularly test soil and have installed a grass driveway to access all crop fields on the farm. 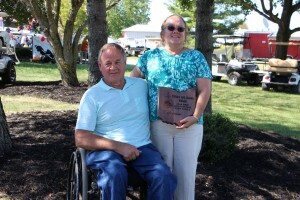 William and Shauna Wilkins were honored with a Conservation Farm Family Award at Farm Science Review, Sept. 22. Other conservation practices include buffer strips, tree planting, and pollinator planting. The Wilkins also shared the importance of being good stewards of the land and preserving it for future generations. “It just makes sense,” said William. Tim and Sandy Shoemaker and Howard Grabill, of Millstone Creek LLC, in Highland County, raise beef cattle and farm more than 100 acres. The Millstone Creek farm was donated and accepted into the Ohio Department of Agriculture’s Farmland Preservation Agricultural Easement Donation program in 2004. Conservation practices on the farm include grass filter strips, exclusion fencing, pipeline, watering facilities, access roads, feeding pads and pasture land. Millstone creek was also a part of a National Grazing Lands Coalition grant to help promote soil health and managed grazing for water quality. 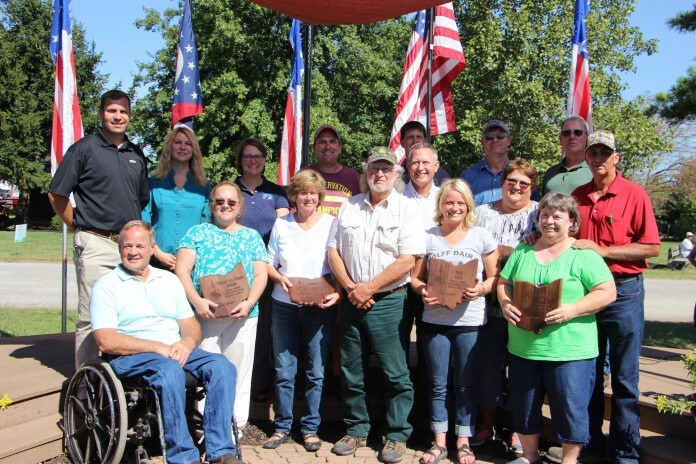 Since 1984, the Conservation Farm Family Awards program has recognized 171 Ohio farm families for their efforts conserving soil, water, woodland, wildlife and other natural resources on the land they farm. Conservation farm families also host a variety of educational programs, opening their farms to schools, scout groups, farm organizations and others.